I’m on a bit of an Atos fest tonight…. wonder if they will say I’m inciting hatred against Atos staff? Oh hang on… how can they when all I’m doing is reporting the facts ..
A grieving husband received official letters addressed to his late wife months after her death – threatening to stop her incapacity benefits. 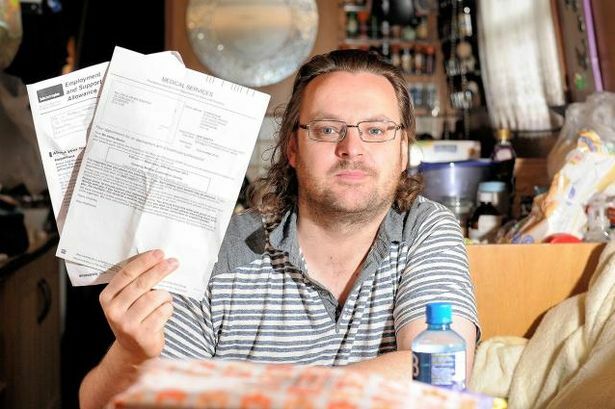 Alan Baxter, 39, lost his wife Lyn in June last year – but continued to receive letters from Atos Healthcare warning her that her benefits would be cut off unless she attended a meeting. Atos Healthcare, a government organisation which conducts disability benefit assessments, continued to contact Lyn Ashby-Baxter for six months after her death at the age of 49. The letters informed Lyn – who had suffered from a range of medical issues – that if she didn’t attend an assessment her incapacity benefit would be cut. Self-employed designer Alan said: “When my wife died, I used the Registrars service to inform all the relevant government bodies – including benefits agencies – that she’d passed away. They cut off her money immediately. “When I received the first letter from Atos in November, telling Lyn about the assessment, I just filed it away and thought no more about it. I thought the information would filter through. “Then I received the next letter, asking Lyn to explain why she hadn’t attended and threatening to cut her benefits. “I couldn’t believe it. My wife died young, and dealing with her estate was a very emotional task. You can just open a drawer or something and the memories come flooding back. When Alan finally called Atos, they explained that they were using a different computer system, so the information hadn’t been passed on properly. Lyn had suffered from bipolar disorder, a condition which led her to self-medicate with alcohol. Since her death, Alan has been living on a canal boat in Nuneaton. Geoffrey Robinson MP was outraged when Alan came to him with the letters. He said: “Nothing has shocked me more as an MP. This demonstrates the utter incompetence of Atos Healthcare and why the public are rightly angry about the way they unfairly treat people. This entry was posted in Uncategorized and tagged Atos, disability, Geoffrey Robinson. Bookmark the permalink.